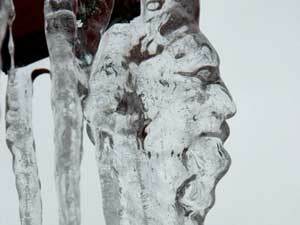 Old man winter pays Northwest a visit -- literally! Just looking outside and you can tell Old Man Winter paid us a visit, but in Lake Stevens, it looks like he put in a personal appearance! This icicle was found hanging from Jeremy Olden's home. There is another wider angle shot at the KOMO website. This page contains a single entry by DaveH published on December 22, 2008 8:48 PM. Merry Christmas and watch out for the Ham in the Salad bar was the previous entry in this blog. That's it for today is the next entry in this blog.